This is a three-day (18 hours) professional course, which thoroughly covers the Android Applications UI/UX Design in the first three lessons and Monetization Techniques in another three lessons. This course is mapped for AND-803 exam. UI/UX design fundamentals and the design thinking process. A comprehensive guide to wireframing and prototyping Android applications. Usability testing, compatibility, performance and stability of Android apps. A UI/UX Designer Journey in Android Apps. Understanding different techniques to monetize Android applications. Publishing and advertising your application effectively. Explaining how to add licenses to your applications and monitor them. 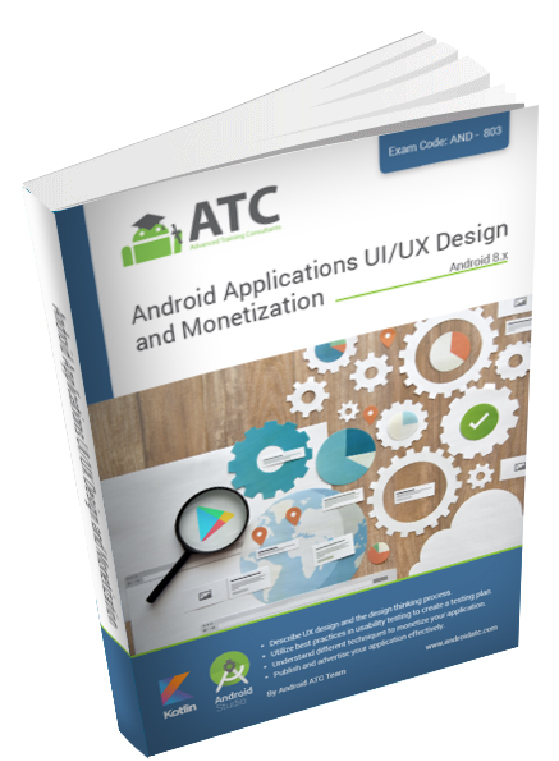 After completing this course, you will be ready for the “ Android Applications UI/UX Design and Monetization Techniques ” exam (exam code: AND-803). This book can only be ordered in hard copy format. The total price of the book including shipping and handling is 59 USD (Delivered globally within 4 business days using express shipping). Click here to place your book order now.